In our first week back from Winter vacation we focused on reviewing the basics as well as "post-positions". This provides us with a great opportunity to review the basics but also to learn a new part of the Lakota grammar! 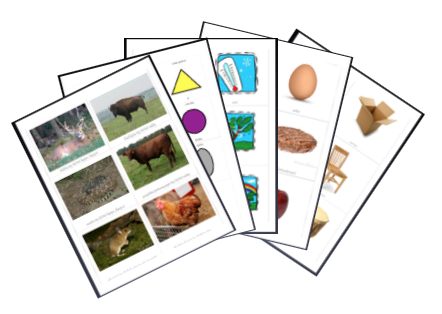 Download and print the files that contain basic vocabulary terms to review. - Wičhíŋčala kiŋ šiná yámni yuhá. - The girl has three shawls. Notice that even the words "the girl" and "three shawls are worded differently: "girl the / wičhíŋčala kiŋ" and "shawls three / šiná yámni". As you may expect, Lakota does not have prepositions but POSTpositions, meaning that the word comes after the noun. Wówapi kiŋ wáglutapi kiŋ akáŋl yaŋké. - The book is sitting on the table. Try making simple sentences about the objects that are around you! Also, check out the LakotaDictionary.org section devoted to the use of Lakota Post-Positions. View the page to see many more examples of Lakota Post-Positions as you can even post your own sentences there. Wóžuha kiŋ oyúŋke kiŋ oȟláthe yaŋké. - The bag is sitting under the bed. Šiyútakaŋ kiŋ akáŋwowapi kiŋ isákhib yaŋké. - The laptop is sitting beside the desk. Wíčazo kiŋ oákaŋke kiŋ itȟókab yaŋké. - The pencil is sitting in front of the chair. Wíyatke kiŋ wóžuha kiŋ ihákab yaŋké. - The cup is sitting behind the bag. Write sentences using the following pictures of animals. You can repeat some of the more common postpositions (i.e. beside or on). Šúŋka nážiŋ. - The dog is standing. The raccoon is standing on the laptop. The turtle is sitting next to the rabbit. The rabbit is sitting next to the turtle. The polar bear is sitting. The polar bear is sitting by the sheep. The sheep is sitting by the polar bear. The dog is sitting on the rug/next to the table/in front of the shoe/etc.. The rug is sitting below the dog. The shoe is sitting behind the dog. The fish is swimming beside the dinosaur. The dinosaur is standing next to the fish. The fish is swimming above the rock. Post by Lakȟól’iyapi Hoȟpí (Lakota Language Nest). Check out the children using postpositions with Lála Tom! Test yourself and see which ones you can recognize! "The Lakota Language Nest is fortunate to be a part of Sitting Bull College. This partnership enables the children in the nest to have an amazing science center. Our future Lakota scientists in action."